It's three weeks exactly until my trip to New York to decorate cakes with Kelly Ripa, thanks to Foodbuzz and Electrolux. Three weeks until our group of prominent food bloggers spends a day with one of the biggest stars of daytime television to ice, frost, pipe and sprinkle on behalf of the Ovarian Cancer Research Fund. Three weeks until I make a complete fool of myself. Or maybe not. I might be making progress. For, as you can see in the photo above, I managed to bake cupcakes, make a simple buttercream, and experiment with not one, not two, but four different decorating tips. 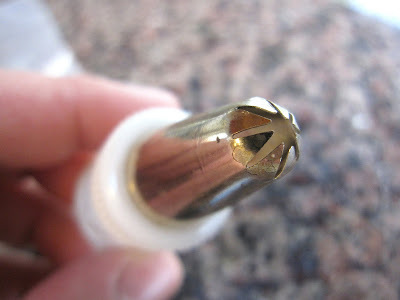 Which also means I managed to figure out how to get the pastry bag, coupler and tips to go together. And I know you can't see this from the photo, but you'll be happy to hear that I did all of this with some measure of grace and confidence, and without squirting frosting all over the kitchen. Because Rose Levy Beranbaum's The Cake Bible left me a tad overwhelmed, I looked for simpler options. I chose a foolproof cupcake recipe, the Emergency Blender Cupcakes from Abby Dodge's Weekend Baker. I love the texture of these cupcakes - light and with a beautiful moist crumb. They really say chocolate, too, not like some of those commercial brown cupcakes that might as well be colored with tree bark. I made them in the food processor because we don't have a true blender - and the recipe wouldn't fit in my beloved Magic Bullet - and I used olive oil instead of canola, because I forgot to restock the canola oil after Hanukkah. The cupcakes turned out perfectly. Are they gorgeous? No. Professional-looking? No. I'm quite sure a talented third-grader could do better. But they're passable. And it's the first time I was able to complete a project involving a pastry bag and my decorating tips without tears. I do have one question, though: The frosting got noticeably softer as I was piping it. Is this because I used a simple recipe that was basically just powdered sugar and butter, and the butter melted from the heat of my hands on the piping bag? Does that happen all the time? I do have very warm hands - good thing I'm not a professional pastry chef - so is there a better kind of frosting for me to work with that won't melt as quickly? Or do you have to stop and put it in the refrigerator from time to time to firm up? Advice welcome. Your cupcakes look FAB! I'm glad you like my Weekend Baker and Emergency Cupcakes -- it's my go-to recipe as well. Have fun with Kelly Ripa! Abby, I'm so delighted you stopped by! Thank you for that great recipe. It's going right in my recipe box - I know it's going to get a workout. And by the way, my husband, who is notoriously picky, LOVED the cupcakes (he took off the frosting, though - I made him eat the ugliest one). You're going to be famous! Want to bring those cupcakes to my house and have some tea? Erika, I think they're gorgeous! Congrats! 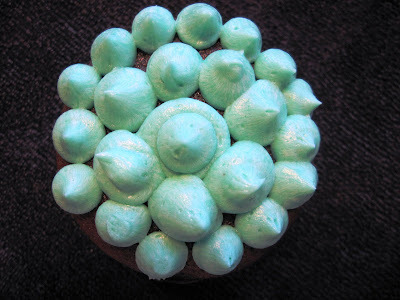 The pretty robin's egg blue looks so chic on the chocolate cupcake. Lovely! As for the buttercream - you're right, the heat of your hands does tend to melt the frosting. 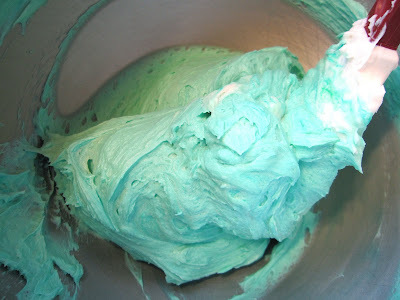 When I was doing my cake business, I would often have to stop while piping and put the bag in the fridge or freezer for a few minutes to stiffen it up. I have no real tips for the composition of the frosting, but letting the bag chill out for a bit does work.